Borussia Dortmund again took three points on the road with an important win in a tense environment in Frankfurt. Eintracht's Commerzbank Arena was buzzing for the whole 90 minutes, but the difference on the day was match-winner, man-of-the-match, big-money summer arrival HENRIKH MKHITARYAN who proved his worth with two well-taken goals on his "weaker" foot. Henrikh Mkhitaryan...it may be a name you cannot pronounce, but everyone should familiarize themselves with this Armenian star in the making. The new signing demonstrated why a club might just pay millions and millions of euros to have him on their team. A solid performance all around, but most importantly, two goals -- a match-winning performance. The first goal came early for die Schwarzgelben as the hard-working Kuba did well to win possession back. The pacy Pole sped quickly towards goal, spotting a streaking run from Mkhitaryan and playing a perfectly-weighted ball through to the Armenian who calmly finished with his first touch. The timing of the run from Mkhi and the awareness from Kuba showed an understanding that many would think had been developed over years of playing together--it seems that Mkhitaryan is settling in quickly and fits quite well. It was a first Bundesliga goal for Mkhi just ten minutes into his third start, but full credit to KUBA...who notched another beautiful assist to add to his glittering Dortmund career. Mkhitaryan showed great poise, cool as a cucumber as he slotted the ball past the goalkeeper on his first touch. Dortmund could have punished Frankfurt at other points of the first half, but lacked the finishing touch. BVB were instead punished themselves in the 36th minute. The pressure in midfield was too light and Frankfurt were allowed an easy service into the area. The attacker was kept on only by Mats Hummels, who may have been slightly out of position, and his header off the post and was bundled in quickly by Kadlec. It was only the second goal conceded thus far, but things seemed a bit loose in several areas of defense as Frankfurt were able to equalize far too easily. The second half continued to be difficult for BVB, and it would be a touch of class that separated the teams on the day as Mkhitaryan took the team on his back and secured the three points with a brilliant solo effort. Players like Schroeck continued to be annoying to Dortmund with their gritty play, but Grosskreutz found space down the right wing and played the ball to Mkhitaryan. Henrikh then gave Johannes Flum a front row seat to the best goal in the house, receiving and then turning on poor Flum, who could only chase him the rest of the way. Mkhitaryan smashed the ball into the bottom of the far corner, leaving the goalkeeper with no chance. Another goal with his left, we may have to really question the usage of the phrase "weaker foot" with Henrikh Mkhitaryan. The first goal was a deft touch and a subtle bit of skill while the second was a fierce left-footed drive...two difficult skills demonstrated perfectly by this up and coming star from Armenia. 1. BvB MKE watched the game in Milwaukee with visiting Dortmund fans all the way from Germany. What a spectacle it was...thanks to Henrikh Mkhitaryan! Keep 'em comin' Mkhi! Much respect to Kuba, our favorite Pole, another classy performance. Kevin, we love you man, and are so happy to have you playing in the team, even if you are out of position you still get forward and have yourself another assist :) Sokratis might have been a bit overshadowed by the big signing of the summer today, but was solid in defense and kept Frankfurt at bay. Well done from the Greek. A perfect start to the season. 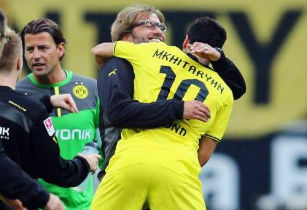 Keep the wins coming BVB!! !